"I first got hooked on mono-printing when I met Mitch Lyons at the Tampa NCECA in 2011. Jeff Reich was the head of the Ceramics Department at the Mesa Art Center in Mesa, AZ and he approached me to do a mono-print workshop. It was so successful that he then asked if I would teach a class that featured mono-printing and the rest is history. Mono-printing is just what it sounds like - a one time print on clay using colored slips, underglazes and colored “chalks”. What you create in clay is only limited by your imagination!" 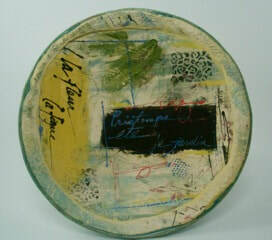 "I have been a past member of the Ceramic Research Center Tour and Arts Advisory Council at ASU. I have been playing in clay since the late 80’s. I am currently still teaching ceramics at the Mesa Art Center - Altered Pots, starting Tuesday, January 15, 2019 at 1:00 p.m., Cottonwood in Sun Lakes and Encore at Eastmark in Mesa." ​Instagram : @salem_mudwitch and Pinterest: Diane Watkins. To help members navigate the show and sale application process, Arizona Clay is hosting a presentation entitled "The ABCs of Entering a Juried Show". 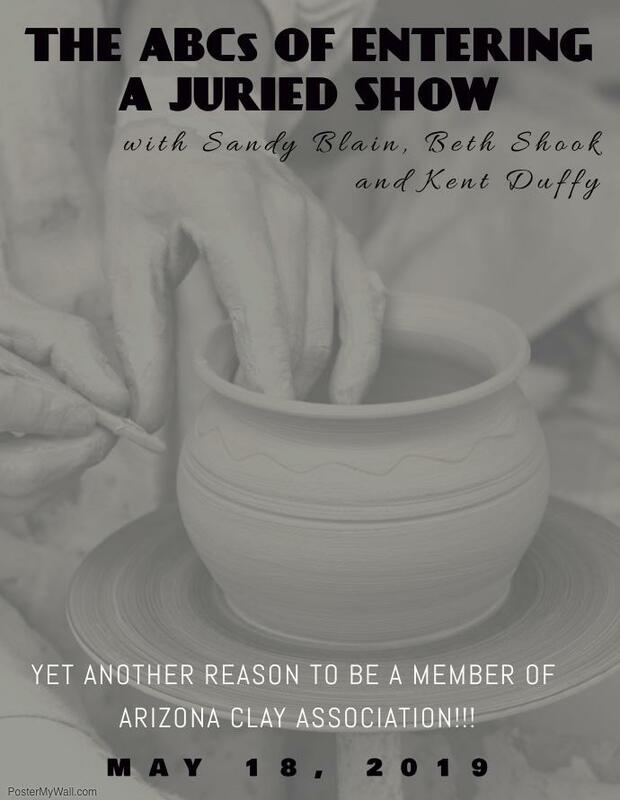 Highly respected ceramic artists Sandy Blain and Beth Shook and photographer Kent Duffy will be the presenters. The talk will start with a round table discussion and audience question and answer session followed by a set-up and photo shoot, with an explanation of lighting, shadow, etc. There will be lots of samples to look at and handouts on photographing your work as well as how to write a biography and artist statement. We'll end with a potluck. Note: The event will be well worth the time of ‘seasoned’ entrants too. August: ASU Ceramics Research Tour for members. Details TBA. Saturday, November 16 2019, time TBA, Ceramic Jewelry Workshopwith Jenneva Kayser. Workshop is "hands-on" at Mesa Arts Center, 9am-12pm. There is a maximum of 16 attendees. There is a $20 fee to cover supplies.